A Sunday Tour at 11am. Due to the success of last year’s sell out Valentines Day, we have brought this event back again for another year. Let us show you round our beautiful vineyard, nestled on the edge of the South Downs, and guide you through our unique, fully gravity-fed, state of the art winery. Our friendly and experienced staff will explain the processes involved in making English sparkling wine, as well as what makes Hambledon Vineyard unique, followed by a tasting of all three of our cuvées. Price is for two persons. Tour of all areas of the vineyard including cellar, winery and vineyard. 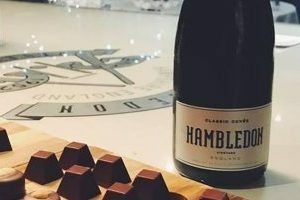 Includes a tasting of all Hambledon wines (3 in total) and a box of HCC chocolates (one box between two).